No Sales TaxOutside the Florida. Children’s closets overflow and get super messy in very little time. They soon outgrow most stuff in the closet and it becomes increasingly difficult to pull out things that fit from an unruly closet. Children need to be taught organizing from a very early age. This will help save a lot of troubles later on when they grow up and have far more things to organize. Paring down the kids’ wardrobe to essentials and a few ‘event’ clothes will help in quicker and easier day-to-day management. 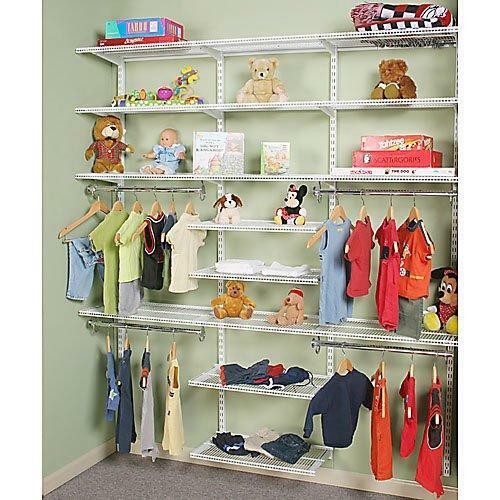 The more clothes your little ones have the more cumbersome organizing will become. Also another point to note is that children become easily overwhelmed by even the easiest of tasks. If you keep it simple and comprehensible then your preschooler or elementary school kid will find it easy to pick matching and fitting outfits on their own. The basic rule to clever organizing is that you should keep at it and never let things lapse. The more regular you are with your organizing tasks the easier you will find it to keep rooms and cupboards clean. Here are a few tips for moms grappling with kids’ closet clutter. 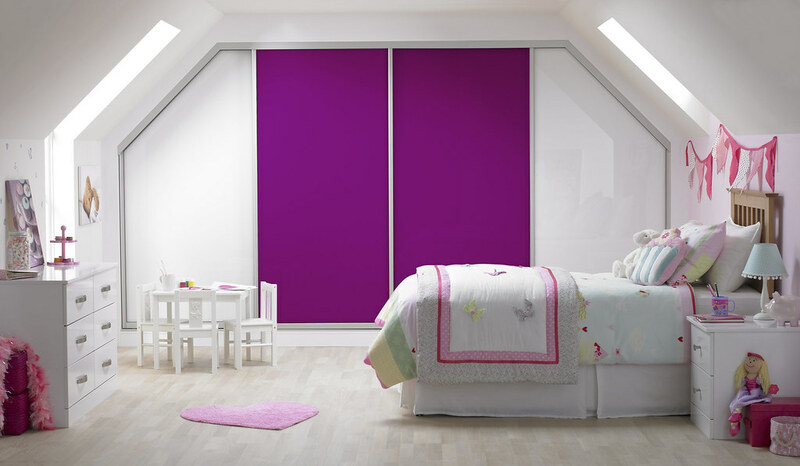 Over-stuffed wardrobes will confuse your kids leading to ‘I-don’t-want-to-wear that’ tantrums and resulting chaos. Go through each and every piece of clothing in the closet and decide which ones are too small, spoilt beyond redemption or several sizes too big. If you have younger children or plan on having more kids, then stash outgrown clothes into a big plastic tub labeled ‘store’. You can save them for the younger/future children in your family. If you do not want to store the outgrown stuff, consider donating them if they are in good condition. And so in they go to a bin marked ‘donate’. If there are clothes slightly spoiled or damaged, put them away in a bin marked ‘mend/dry clean’ to be dealt with later. Make sure you do mend the damaged clothes and remove the stains and spills so that these outfits can be brought back into circulation. Most often kids are gifted clothes that are too big for them. Carefully store these clothes in a quality fabric storage bin to be taken out when your kids are bigger. You will obviously have a whole lot of clothes that are not fit to be worn and will not make their way into the ‘store’ bin. You can trash all that you do not wish to keep or donate. This process of sorting, storing, donating and trashing is the most important to have a manageable wardrobe. You have to keep your emotions aside and handle this like a pro. The more ruthlessly you purge the cleaner will your little one’s closet be. Hanging clothes will not only ensure crease-free clothes but will also help save space in the closet. If you can place the hanging rod low enough, your little ones will be able to pick out clothes on their own. If there are high rods in the closet at a height of five feet or more you can fit in an additional lower bar that will make things accessible to your kids. It will also double the hanging space and enable you to hang off-season clothes higher up where your kids will not reach. Invest in good quality and versatile hangers. They are not only aesthetic and cute, but can also solve a lot of organizing problems. Clothes Vine garment hangers are an amazing space-saving cascading hanger system that allows you to arrange garments compactly. Specialized children’s hangers will allow you to hang pants or skirts and tops together. You can attach rubber hanger strips on children’s hangers that will keep your daughter’s silk, satin, taffeta and velvet outfits from slipping off. There are attractive and colorful hangers available which will liven things up in your kids’ closet. Children love it when things are organized and easy to spot, helping them successfully dress themselves. Another very smart organization tip is to install a double railing set in your child’s closet and put in place a handful of well-fitting clips. You can clip clothes that are very rarely picked up by your kid, or skirts and shirts that get lost in the back of the drawer. This will ensure that once they are in plain sight there are higher chances of your kid wearing them. This post here might be helpful if you want to try out something like this. If you have young kids sharing closet space, it is important you help them spot what is theirs. Your little ones should also know their shelves and cubbies, and where they should keep their stuff. Training to identify their space and organizing it neatly will be hard work for any mom. But there are a few tricks that will help you. You can clearly designate ownership by labeling bins, drawers and baskets. Color coded stickers can be used to assign a particular color to each storage space, and to each child. You should also label the type of clothing/accessories inside each bin so that your children will not get confused. Picture labels are the best method to organize kids’ closets. They make things easy for your children to recognize what is inside and what they need to put in. They also need not open all drawers to find a particular T-shirt. A big bin and a couple of drawers/shelves (all clearly marked) should suffice for a newborn. Do not let the tiny clothes overflow because he will grow out of them in the wink of an eye. Many children’s closets are organized at heights that make them more suitable for parent use. Ensure you keep the in-use items at kids’ eye level so that they do not have to climb on chairs or hang onto drawers to get what they need. This will also maximize the space available in your child’s closet and make it more useful to him. Open containers, wire baskets and clear tubs are great for small children learning how to manage their clothes. Two or three levels of hanging rods are great for the little people to reach their stuff. Pull down rods are also specifically designed to use space in kid’s closets but remain accessible at the same time. If there is space left uncovered by rods and shelving, you can attach wall hooks that can be home to the next day’s school outfits and play clothes. Shallow drawers also solve the problem of inaccessibility in children’s closets. If your child is still struggling, invest in a stepping stool that will be functional as well as fun for your child. Your son would love climbing on it to access out-of-reach places and he can also use it during playtime. When out shopping for children’s clothes, we always tend to overdo it. We buy for the next season, for the next size, for contingencies and for what-if situations. In no time, we have too many clothes to fit into the children’s wardrobe. It’s better you plan beforehand and decide what and how much you need to shop. Weigh wants versus needs and figure out what you will need now and what you plan to shop for coming months/seasons. Quality branded clothing comes at a price and there is not much chance that your little one will wear out a $40 pair of jeans before he outgrows it. Shopping during sales and clearance is the best way to get quality stuff at reasonable prices. You can also browse through thrift and consignment stores, or shop online where there are some fabulous sites that parents swear by. But again, be careful you do not go overboard loading up on kid stuff. Smart shopping also means that you need not go shopping each sale season and for every clearance sale. If you think it will be a great idea to make use of every offseason sale and discounts on offer, then very soon you will end up with a gigantic pile of stuff, which you definitely do not want. Your kids will end up with more clothes than they can use which in turn is essentially the waste of money and time. Also, an organized closet will prove to be tough to achieve. Make sure that you have all pieces of clothing in your kids’ closet accounted for. If it’s hard to remember you can jot down everything in a notepad and then based on what you have make a list of things you need to shop for. Keep in mind that kids need far fewer stuff than we think. Paring down children’s clothing requirements will help you manage their closet better. Set a baseline of what your children absolutely need to get by with and add some more so that you never run short. Plan their wardrobe accordingly and keep bigger and off-season clothes away from reach. If there are outgrown clothes that are as good as new and hardly used sell them off so as to recoup a part of the expense. Organizing and maintaining children’s wardrobe is hard work. And if there are children sharing the closet, then the task becomes even harder. But efficient and effective closet organizing solutions and timely management from your part will definitely help get things together. So, till then, happy organizing! Closet Organization Tips to Get You and Your Family through Every Stage of Life! Children’s Hangers and Other Organization Tips Every Parent Needs to Read! Coat Hangers vs. Shelves: Know What’s Best for Your Clothes! Personalized Wooden Hangers: DIY Ideas for 7 Different Wedding Styles! Copyright 2014, Only Hangers. All Rights Reserved.